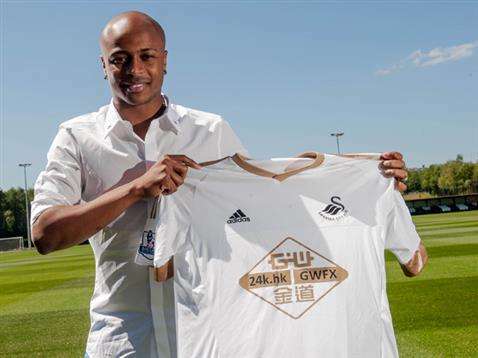 Swansea City has announced a deal to sign Andre Ayew on a free transfer. Ayew had been linked with West Ham prior to joining Swansea and the 25-year-old becomes manager Garry Monk's first new arrival of the offseason. Striker Bafetimbi Gomis is said to have played a significant role in luring him to the club. "I spoke to Bafe, who really wanted me to come here," Ayew told the club's official website. "He told me about the club's record season and also about the team spirit, manager, training, the players and how everyone is united. Those are great things for me to hear. I know the squad will help me settle in and we will help each other to make Swansea a better team – that's what is important. "The project that the club has for the future is very exciting, and when I spoke to the chairman and manager I felt this was the right place for me. I felt that my desire to play in the Premier League and wanting to grow as a player meant that Swansea was the best solution for me in every way."